We travelled back to Sri Lanka in early January to support our friend, the Ven. Keerthi Fernando, at his Consecration and Enthronement as the new Bishop of Kurunegala, on the feast of Epiphany, 6th January. Also see our Facebook photos, see link to left. The Consecration was spectacular. Three separate processions, each led by numerous marching bands and troops of traditional Kandyan dancers, started the service. Over 2500 people had gathered, overflowing into tented extension to the church, and a huge open-air screen. For me it was wonderful to reconnect with so many of the faces we had met during our two months here last year. 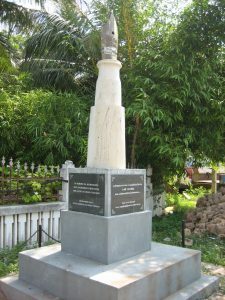 People had travelled from all over the country, Kilinochchi and Jaffna in the north, Galle in the south, to the Up Country area in the middle of the country. The service’s significance was underlined by the attendance of numerous foreign bishops as well as government dignitaries. But for all huge sense of occasion it has to be remembered that Anglicanism represents a tiny minority faith in Sri Lanka (Footnote: There are about 50,000 Anglicans, out of a population of 22million). Many ordinary Sri Lankans we encountered had no notion of the Anglican Church. The service demonstrated the strong multifaith relationships that the Anglican church has nurtured in the Buddhist majority country. The very best seats in the proceedings were given to the delegation of Buddhist monks who sat through the whole 4.5 hour service in reclining lounge type chairs in the front of the church. While they took no part in the service, even standing for any part of it, the presence was valued, sitting even in front of the members of Government. One of the most precious gifts Bishop Keerthi received was a staff from an Orthodox Bishop from the Malankara Orthodox Syrian Church, a church which traces its self back to the mission of Thomas the Apostle in the 1st century. For Bishop Keerthi, their presence was particularly valuable, a visible reminder of the long tradition of Christianity in the Indian sub continent, which includes Sri Lanka; long pre-dating the arrival of the colonial missionaries. The Anglican church though small, plays an important part Sri Lanka. With thousands of children educated in the 14 Anglican schools. It is one of the few institutions that is spread geographically throughout the country and attracts members from all strata of society as well as ethnic and language groups. Congregations are drawn from the well-educated Sinhalese urban middle classes, from the deeply isolated Upcountry Tamils, and from the Tamils in the north and east rebuilding their lives in the aftermath of the civil war. Please keep Bishop Keerthi in your prayers has he tackles some of the huge challenges of his new role, not least that his new role has been vacant for the past 2 years. This entry was posted in Alex's Sabbatical on January 18, 2018 by Alex Bienfait. 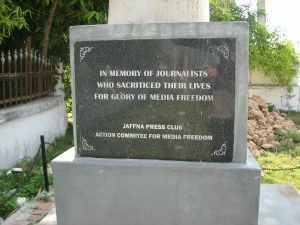 Today Good Friday, I think of this small poignant memorial to journalists. We came across in Jaffna, with our recent visit to the north. I do not know how many journalists have been killed, or injured, but it is a reminder that only very recently, Sri Lanka was said to be the most dangerous country in the world in which to be a writer. Many of us reflect today on the death of Christ, and how Jesus continued to speak truth under the threat of violence. Ultimately we witness that love wins through: may that give us the strength and courage to do the same. Thankfully Sri Lanka is nowadays a much more free and open country. If you want one tragic example from Jaffna, look up the life of life of Dr. Rajani Thiranagama. a tireless campaigner for peace, understanding across the ethnic divide, human rights and feminism. In 1989 she co-authored a book The Broken Palmyra. A few days after its publication, she was shot dead in her home town of Jaffna, while cycling back from work. Rajani, a Tamil Christian married to a Sinhalese man, was someone who supported and worked for the LTTE (Tamil Tigers) but ultimately became critical of their violent tactics. In 1989, she wrote: “One day some gun will silence me and it will not be held by an outsider but by the son born in the womb of this very society, from a woman with whom my history is shared.” A few months later she was killed. Rajani did not know then that the violence would continue for another 20 years. To explain the title of her book, the palmyra palm, Borassus flabellifer, is the traditional emblem of Sri Lanka’s Northern Province, and a symbol of many of the region’s challenges. Travel to the north and east used to be called “going behind the cadjan curtain”. Cadjan is a wicker-like material, made by weaving dried strips of palmyra together. Thus the palmyra palm is synonymous with the Jaffna peninsula. We have witness tens of thousands of palms being planted, a sign of confidence for the future. This entry was posted in Alex's Sabbatical on April 15, 2017 by Alex Bienfait. 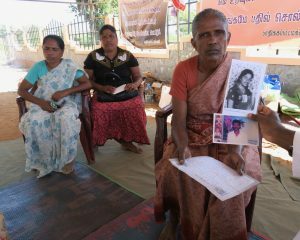 Kitnapilai Rasmani and holding photos of her two children both of whom have disappeared, Mullaitivu. Her son was an LTTE cadre, he was injured and taken by the ICRC to hospital. Her son managed to get a letter written by friends (He could not write) sent to her, giving details where he was recovering. Five days after receiving the letter she went to the hospital, but told her son had been moved to another government camp to make way for new casualties. No news after that. Her daughter was at school, but then forcibly recruited by LTTE as a cadre in the closing stages of the war. No news after that. We have been travelling around the north of Sri Lanka, among the areas that were formerly controlled by the LTTE (the Tamil Tigers). Universally, people express relief and joy that the fighting is over, but there is still much to happen to win the peace. An issue that some of our Anglican colleagues are actively supporting is the plight of those who desperately seek news of relatives who have been missing since the end of the war. 20,000 people are believed to have “disappeared”, and nearly eight years after war ended, their parents do not know whether they should grieve, or hold on to that glimmer of hope that their loved ones are alive. Two presidential commissions were set up to inquire into the missing, but a man who has worked with one of the commissions told us: “We failed to get information for a single one of those who had disappeared.” The lack of progress is now leading to protests which are bubbling up all over former LTTE areas. We were accompanied to two such protests in Kilinochchi and Mulaitivu, by local clergy. The protests take the form of sit-ins beneath simple roadside shelters where photographs of the missing, all young faces, adorn the makeshift walls. The relatives keep a dignified vigil, taking turns to ensure that there is a continuous presence. We heard numerous individual stories. Most disappearances took place at the closing stages of the war. All except one of the former LTTE cadres we heard about voluntarily surrendered themselves into Sri Lankan Army custody, and were not heard from again. A significant number disappeared from hospitals where they were receiving treatment. People contend that large areas of land remain out of bounds to the public, and that this is where the are secret camps are suspected. This is supported by fleeting film footage from from documentaries, such as that made by Channel 4, that have provided tantalising glimpses of some who have disappeared. Eight years on, and with a less authoritarian government having been elected two years ago, there are others we have spoken with who doubt the existence of such camps. They highlight that covert arrest and detention has regrettably been a method of enforcement of authority and control in recent decades, and not just in 2009 as the civil war was ending. Forty years on for instance, there are many Sinhalese who are grieving for relatives who were abducted during the JVP uprising in the south, and never returned. What the relatives want is to be treated with honesty and dignity. After so many years of violence perpetrated by both sides, it is hardly surprising that beneath the light-hearted smiles, huge bitterness and mistrust continue to exist. Could a new solidarity be fostered, between grieving relatives of the disappeared from both Sinhala and Tamil communities, to force a new era of openness from the Government? If this conflict feels remote to our lives in Britain, creating a creative harmonious community remains an ever-present challenge for all of us. Fundamentally, it can only take place when we treat each with other dignity and respect. Please keep the ministry work of clergy in these former war torn areas in your prayers, as well as the patient vigil of the relatives of the disappeared. This entry was posted in Alex's Sabbatical on April 8, 2017 by Alex Bienfait. I offer some of Michael Northcott, reflections on “Journey as a Quest” reproduced below, and summarises some of my feelings about what I hope our journey is about. But it may also speak, help discussion for those who will shortly watch the film The Way, which the will be the focus of the Biddenden and Smarden Lent study group this year. Literary accounts of heroic journeys that encapsulate the archetypal desire to travel are, like traditional pilgrimage, set apart from rapid mechanical journeys of the modern tourist in their description of the formative role of chance and circumstance that the hero encounters on the way. At the outset of the journey the hero often has little idea of the end in view, and even less confidence in his capacity to reach it. The eventualities of ups and downs of the journey are therefore crucial to the acquisition of the virtues and skills that the hero needs in order to attain the goal. J.R.R. Tolkien’s The Lord of the Rings powerfully evokes the way in which at the beginning of many classic narratives of heroic journeys the hero is often hardly a hero at all; hobbits are at first sight too quirky, short, and physically weak to perform the valiant task set before them by Gandalf. Along the way Frodo the hobbit chosen for the quest, is plagued by self-doubt about his ability to succeed. By being open to the gifts and interventions of friends, strangers, elves, ents, and even enemies, the hobbit who becomes a hero is eventually able to complete the quest to cast the ring into the fires of Mont Doom, and so save Middle Earth from the militaristic and technological darkness of Mordor. But there is also a contrast between Tolkien’s tale and other shamanic myths in which the hero gradually acquires mastery and new powers through the journey which enable him to fulfil his quest. At no point does Frodo become a master of the ring, or even master of the journey. On the contrary, he relies on Gollum to guide him for much of the way, and by the end Frodo has so fallen for the dangerous attraction of the ring that he only succeeds in destroying the ring through the intervention of Gollum, who in one last desperate attempt to wrest the ring from Frodo falls into the fires with the ring in his clutches, and so destroys it, and with it the rising and destructive power of Mordor. With this crucial twist in the tale Tolkien has evoked the essential feature of the Christian conception of the life as a journey or pilgrimage, which is that of learned dependence. Far from achieving mastery and autonomy, the Christian pilgrim goes the way of the cross and therefore seeks to remain humble and open to the gifts and trials which each turn in the road, each step may bring. Mastery and control are not the ends in view, but instead encounter and submission to the Master, and a related preparedness to endure the rigours and rewards of life on the road. . . . This entry was posted in Alex's Sabbatical on February 28, 2017 by Alex Bienfait. Sunday 26th February, Holy Trinity, Nuwara Eliya. Sunday 26th February: we were in Holy Trinity, Nuwara Eliya. We accompanied our friend Fr. Keerthi Fernando who was the guest of honour at the celebration of the church’s founding, 165 years ago. Holy Trinity has a strong colonial past. Nuwara Eliya, known as “Little England,” is very high, 2,200m, with a gentle mild climate that made it a popular retreat for the British from the hot summers. Its most famous visitors include our current Queen who dedicated a window in the 1950’s. The church now hosts a vibrant mixed Tamil, Sinhalese and English-speaking congregation. Before the formal church service, we took part in a celebratory procession that wound itself through the town. This was a surreal mixture of traditional Sinhalese dancers, Mothers Union, the “Gents group”, as the impatient traffic weaved past, accompanied by the odd fire cracker. We also had a couple of youth bands and lots of members of the congregation. At points along the way we stopped and prayed for the town and its institutions of government. Once in church, the trilingual service began. Just imagine the logistics of making the mammoth service paper, and how you prepare a sermon that will need to be translated twice over – from English into Sinhala and Tamil. Things overran by quite a bit, with the service that was initially suggested to us finishing at about 11:30am, actually completed by 12:45pm, having started with the procession at 9am. I think I contributed to part of the delay, being invited to do an individual children’s blessing during the final hymn. I don’t know how many children there were, except that they had to sing the final hymn twice, and then improvised an extra one to all me to get through the huge queue of children that snaked down the aisle to the altar rail. Things didn’t finish there. There was the planting of 165 trees to form a new cypress hedge, and a rice and curry lunch, that consisted of a lentil dhal, green beans and onion, a fish sambol, and a chicken curry. We were grateful for the generous warm welcome. A video clip is on the Facebook page. This entry was posted in Alex's Sabbatical on February 27, 2017 by Alex Bienfait. Does Fairtrade really make a difference? We currently in the heart of Sri Lanka’s tea growing estates, staying in a town called Bandarawela. We can be easily persuaded by cynicism that suggests that paying extra for fairly traded tea, coffee, and bananas goes only to increase the profit margins of supermarkets. Do the workers really benefit? Today, during a visit to an organic Fairtrade tea factory we were surprised by what we found (an unofficial visit, so we aren’t naming the factory concerned). By chance, we had made another visit to a conventional tea factory just only a couple of days ago. That factory was interesting enough, but as soon as we started today’s visit we immediately noticed a difference as we were asked to dress in special gowns, face masks and bags to cover our shoes, something the other factory did not require of us. Inside the Fairtrade factory, staff were likewise kitted out with protective clothing and the environment was scrupulous clean. There was none of the slap dash attitude we saw in the previous factory, where we frequently saw processed tea leaves falling onto the floor, which were then swept up and put back into the process by staff who wore no protective clothing. By contrast in this Fairtrade factory, staff continually took great care that there was no spillage. Workers at the Fairtrade factory are actively encouraged to help improve the production process, with rewards and promotions for those who perform best – there was no evidence of this at the conventional factory. But there is more that is inspiring to the story of the Fairtrade tea factory. The original vision for the project was driven by a Muslim who now has a multifaith workforce. Our guide, an Anglican, told us that each day begins with prayers, the workers assembling in whichever faith tradition they are part of (most are Hindu), undergirding the spiritual foundations of the organisation. Out in the field there are notable differences with conventional tea plantations. The absence of chemicals in the organic system results in better health for the pickers in the field. Staff live in individual houses, with electricity and space around to grow food, instead of rows of shacks reminiscent of hop pickers’ huts. So it was really encouraging to witness how Fairtrade really does make a difference. This entry was posted in Alex's Sabbatical on February 23, 2017 by Alex Bienfait. For photos check the Facebook page. We went to St. Francis of Assisi, Mt Lavinia, Colombo this Sunday, receiving a warm welcome from Fr. Melvin de Silva. The main Sunday morning service was at 7:30am, but in case you think that is early enough, there was also one at 6am! But in our case, we followed our normal rhythm getting up at 6am, and got ourselves there at 7:20am to a sparsely filled church. But as service progressed there was a steady inflow of people of all ages. The two teenagers, acting as server and crucifer, sheepishly brought in the Cross 10 or 15mins after the service had begun. After the service there was the usual tea and chat (we handed mugs of milky sugary tea poured from big jugs). People didn’t disappear, they hung around and chatted in groups all over the church. Then I realised that part of this was due to the various groups; Sunday School, Mothers Union, which started after and a teenage youth group a bit after that, all of which started after church. It was impressive to hear something of the social witness, and the community life that holds the church so strongly together. One family spoke movingly about how they’d started coming following the welcome their autistic daughter had received. We also heard about the free drop-in medical clinic the church runs, through volunteer doctors who are member of the congregation enabling patients to avoid whole-day visits to hospital. In the evening we were invited to a talk on a conflict in the Yugoslavia, by a Slovenian writer. Totally surreal, but fascinating, and relevant, more later. My sabbatical will have two foci of interest. One of those, will be to research churches where congregations meet for different types of services just once a month. The other focus will be a long visit to Sri Lanka: that is the subject of this article. This entry was posted in Alex's Sabbatical, Sri Lanka on February 9, 2017 by Stephanie Boucher. My sabbatical will have two foci of interest. The first, and the one that will grab immediate attention, is my trip to Sri Lanka. There I will be re-establishing an old friendship with a Sri Lankan Anglican priest who studied at the University of Kent 15 years ago, while I was vicar in Whitstable. I plan to say more about the Sri Lankan angle in a future magazine. My second focus will be to explore other churches where congregations meet for different types of services just once a month. One of the trends we have seen in church worship over the past 50 years is an increase in the variety of services on offer. This is very different from the situation in the 1960s and ’70s, when the ideal was considered to be the weekly communion service as focus of unity in the parish. Back then, the great bold vision was to bring the community together in a single service, as a symbol of the unity of the family of God. This entry was posted in Alex's Sabbatical, Fragmented congregations on February 9, 2017 by Stephanie Boucher. Early next year I will be taking three-month sabbatical. I anticipate that my last Sunday will be 5th February, coinciding with our evening celebration of Candlemas (though I will participate in the annual wedding preparation morning on 11th February). I will be back at work on Monday 15th May. My sabbatical will have two foci of interest. One is to travel to Sri Lanka and re-establish contact with a Sri Lankan friend and Anglican priest who studied at the University of Kent about 15 years ago, living in Whitstable when I was there as Team Vicar. My other focus will in in Britain, looking at churches where congregations gather for services which are just once a month. This entry was posted in Alex's Sabbatical on February 9, 2017 by Stephanie Boucher.